To compensate for the additional power required for the external sirens, the Adaptec TA can be used as a power supply and backup in case of power failures, ensuring that your alarm system is always running. Connecting your terminals to the Adaptec TA ensures a stable and reliable power source for your system to operate at optimum capacity. By connecting the terminal and external siren to the Adaptec TA, the internal relay of the terminal will be protected from the high voltage. If the voltage is too high, the fuse in Adaptec will break the circuit, thus protecting the internal components of the terminal. 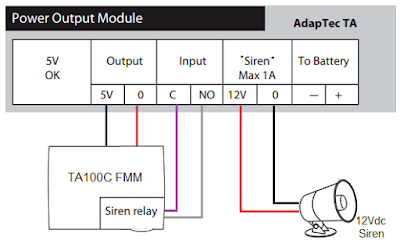 Adaptec TA has 2 power sources, 5VDC and 12VDC and you can connect any of FingerTec terminals to Adaptec TA by selecting the correct voltage. It also comes with a backup power in case of power failure. To connect the external siren to the terminal, follow the steps below. 1. 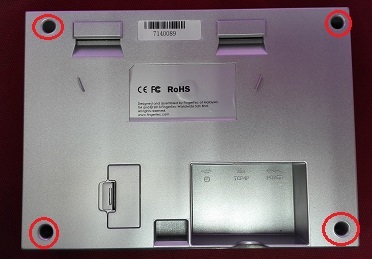 Open the back casing of the TA100C (FMM) terminal. 2. Plug in the connector of the external siren into the MCU Board. 3. Follow the wiring diagram to connect the terminal to Adaptec TA. 4. 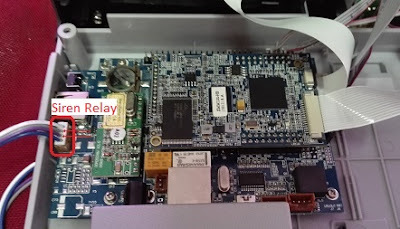 Change the External Bell Relay settings in the terminal device itself. · Bell Status: To turn the bell on or off. · Bell Time: Set the time for the bell to ring automatically. · Repeat: Set the bell to repeat on certain days or every day. external bell that is wired to the device. · Ring Tone: Select your preferred ringtone that will emit from the bell. · Internal Bell Relay: Specifies the time duration for the alarm to ring (ranges from 1s to999s). · External Bell Relay: Specifies the time duration for the alarm to ring (ranges from 1s to999s). I would like to know that why is there problem in downloading fingerprint template of model AC900 from your BioBridge SDK demo application. it returns error code -1 for each user. I have also tried from Colored Devcie Demo for model TA500 But same error code is shown. Regarding on your question about Biobridge SDK, we recommend you direct send email to support team at support@fingertec.com so we can forward and check with SDK programmer. At the sometime, You also can attach some screenshot, to show the problem when using Biobridge SDK. Appreciate your feedback.